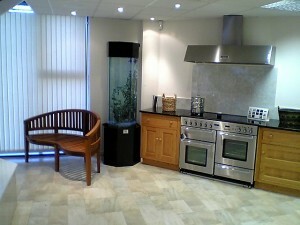 Aquarium Services from Seefish - Seefish Ltd. Aquarium Services from Seefish - Seefish Ltd. Here at Seefish, our aim is simple, It’s our job to keep your fish tank beautiful and your fish healthy, yours is to feed and enjoy watching them swim. It really is as simple as that. With our aquarium design, installation, maintenance, cleaning and rental services, Seefish brings you the joy of fish keeping without the work. Where as watching fish swim has been medically proven to reduce stress, lower blood pressure and stimulate your brain activity. Seefish offers comprehensive services for dealing with your fish and aquarium. We are able to develop flexible maintenance programs to work around your schedule, and we are always available should an emergency arise. Routine maintenance such as cleaning out filters, ensuring the aquarium equipment is working properly and general all round cleaning can take time and effort. This is where we at Seefish come in. Our years of experience and working methods mean that your tank and fish will remain at their best all the time. We provide a monthly service booked in advance. The visit occurs around the same date each month when the aquarium is cleaned and decor replenished when necessary to maintain maximum visual appeal. Fish and live plant are added when required and all foods and equipment are delivered ready for you to use… need anything? We will deliver it free of charge.. No more trips down the town because you are out of food! Seefish is a full service aquarium maintenance company, specializing in all types of aquatic ecosystems. We offer sales and service of freshwater and marine aquariums in both commercial and residential settings. 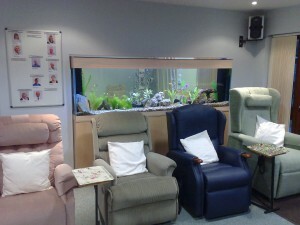 Seefish has extensive experience in providing aquarium installations for commercial customers including surgery waiting rooms, hospitals, care homes, offices etc. We focus on working closely with you or your contractors through all stages of design, construction and installation. Seefish offers a variety of different maintenance plans to suit the needs of any aquarium on any budget. No tank size is beyond us, from 20 gallon nano tanks to full shop systems.